NoteDown is a free Windows 8 Notepad app that lets you create, open, edit, and save text files easily. Not just this, you can also share text notes with others, via e-mail. This free Windows 8 Notepad app is packed with all usual editing options such as cut, copy, paste, undo, redo, etc. It also supports common text formatting options. You can search for a word in the document using Find option. 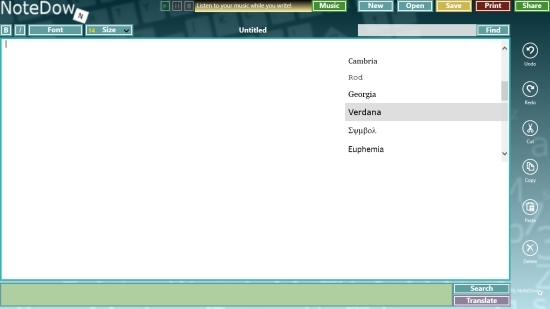 However, it also features some more interesting and unique functions such as making online search of a selected text or translating a selected text. Moreover, you can access your music library straight from the app and listen to your favourite songs while you are writing. NoteDown is freely available under Tools category of Windows Store. You can search for the app in Windows Sore using Win+Q key combination or view it directly in Windows Store by clicking on the link given below at the end. Let’s see how this free Windows 8 Notepad app works. NoteDown app is a useful notes taking tool with an amazing user-interface and several interesting features. You can either browse and open files from your system or create new text files in the app. It supports txt and rtf text file formats. You can select font style and size while creating a text document or make your text bold or Italics. As you land on the app’s Start screen, you will find two options – New and Open. To create a new text file, click on New option. The next screen will display a notepad with various formatting and editing options placed beautifully on the top and along the side. Select your font style and font size using the dropdowns placed on top of the screen and simply start typing your text. Once your document is complete, you can save it on your system in txt or rtf format. To do so, go to the arrow icon on the extreme right corner of the screen (see the first screenshot). It will display options New, Open, Save, Print, and Share. Click on Save option to select a desired location and output format and save the text file on your system. The Print option will let you directly access a printer from the app and print a document. You can share a text file via e-mail using Share option. 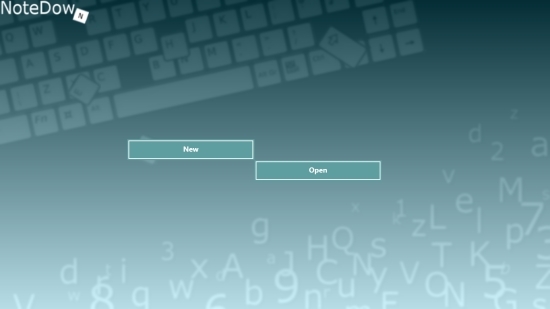 New and Open options that appear on the top makes it convenient to quickly open or create a new text file. You will also find Search and Translate options below the app’s screen. Using these options, you can either search or translate a selected text. But, be sure that you have an active internet connection to make use of these features. The app uses Google Translate to translate the required text in desired language. Also try: TuTu Note and Chalk Pad. NoteDown is an amazing Windows 8 Notepad app with a long list of interesting features. You can make online searches and translations and also play music straight from the app while working on a text file. I will recommend this app without a second thought. Give it a try and share your feedback via comments.